Barbara Deckert at the site of her fiancé’s death on Aug. 10, 2017 in Brighton. Ron Edwards was killed by a driver who ran a red light and hit him on his motorcycle. Corina Triffet, mother of Cody Gray, a 19-year-old killed in an accident in 2016 that also took the life of a passenger at the site of the crash on National Western Drive in Denver. Corporal David Trujillo, Denver Police Traffic Operations Bureau DUI/DRE, continues an investigation of a one car accident where the driver is suspected to be under the influence, after the suspect was brought to the Denver Health Medical Center for treatment Aug. 9, 2017 in Denver. The scene of a rollover crash that killed three teenagers near Conifer in May 2016. 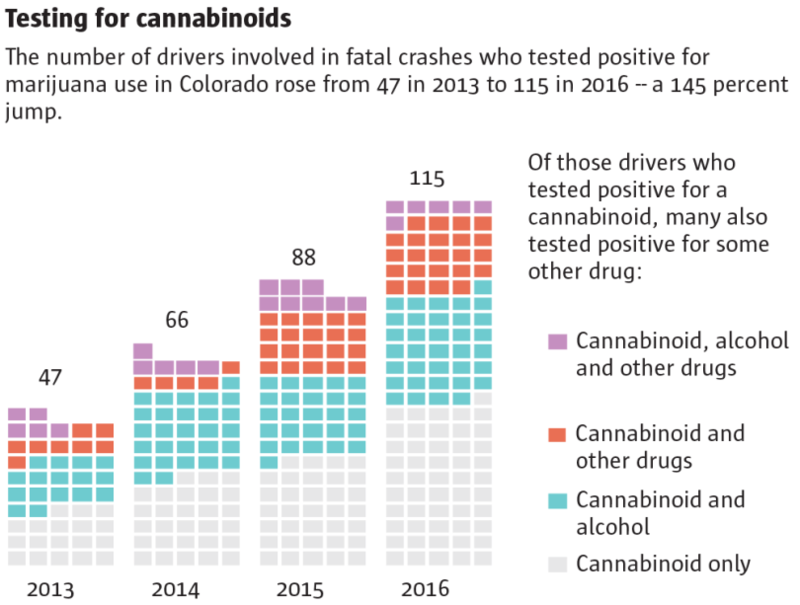 The driver, 18-year-old Jake Whitting of Long Island, New York, had 8.5 ng/mL of Delta-9 THC in his blood at the time of the accident, according to the Jefferson County coroner’s office.